Not that I don’t like wolves, but if it had been up to me, I’d have built a (metaphorical) fence along the border with Oregon to keep the wolves out of our state. I didn’t want to add wolves to the list of problems we have related to managing our deer and elk. So, now it’s time to adjust. Deer and elk are the stuff that wolves are made of. If you worship wolves you have to love deer and elk. They are inseparable. Now that the wolf is a listed species in California, I see two possible choices – ignore the critters and wait to see what happens or prepare for them by building up our elk and deer habitat. I’d prefer to be proactive, but it will take a lot more than my support to make a wolf plan successful. We need more of the stuff that wolves are made of.We need more ungulates and we need them in a big way. If we set the table and prepare the venison, the guests will arrive and be happy. Ungulates are to wolves what grass is to elk and buck-brush is to deer. Current California does not currently have enough food for wolves. Our habitat is fragmented, neglected and unproductive. Without large-scale habitat manipulation, neither deer, elk nor wolves will be successful in California – wolves listed or not. Ask any hunter and he’ll tell you that deer numbers are declining in California. and that we have few elk. Ask and old hunter and he’ll tell you about the good-old two-deer days when you could hunt the Sierra Nevada mountains from the Oregon border to Mono Lake with one deer tag during a season that lasted from August to November and also purchase a second deer tag to hunt blacktail in the Coast Range. However, now that wolves have been elevated to a status of “Endangered” under the California Endangered Species Act, there may be an improved chance to fund habitat improvement on a landscape scale for their primary source of food. Deer and elk thrive in young habitat. The best example of that is habitat that has been hit by fire. Old shrubs that have reached maturity don’t have nearly as much food value as shrubs that have recently sprouted. A forest that has burned can provide exceptional habitat for several years after the fire and that habitat can continue to be treated by mechanical means to extend the period of productivity indefinitely. Deer and elk are capable of expanding their numbers rapidly in response to optimum habitat conditions. This is prime time for building deer and elk herds. Although setting fire to the woods can be accomplished as part of a habitat project, there is liability and also human-related environmental issues to deal with. Accidentally burning down a private residence cannot be justified by a desire for increased habitat. And, air quality concern as monitored by the air quality people trumps many potential fire projects in California, but not all. Policy changes are sometimes better than cash. A fire doesn’t have to be prescribed in order to be an effective habitat producer. An awareness of how we recover forest from wild-fire could generate progress in the habitat production arena. Policy changes by forest managers could have a significant impact upon habitat recovery after wildfire. If habitat improvement could become a primary concern during the first years after large wildfires, prescribed burning could be replaced by, or augmented by, unplanned natural fire – a good example of turning lemons into lemonade. At this point it is unclear as to whether current law under the California Endangered Species Act or Environmental Quality Act will be an effective tool for funding habitat for ungulates and wolves on a meaningful scale. But during this period of flux, between a Fish and Game Commission commitment to list and the effective date of the listing is a time to be opportunistic. The rules are being formulated right now. And, we must not forget that wolves are still federally listed in California, so maybe there’s opportunity for funding at that level. Another avenue to consider is to lobby for legislation that would require mitigation to offset any loss of habitat for wolves, deer or elk. The listing creates support for legislative activity and lawmakers are watching. How about a statewide policy of “no net loss of habitat for deer, elk or wolves.” Such a statewide policy should be attractive to deer hunters. Forest grazing practices are another large-scale habitat consideration. When properly managed sheep and cattle can contribute to a healthier forest by making more habitat accessible and palatable to ungulates. Is California’s range-land functioning optimally? Private land can be a very important niche in wildlife management. The private sector can manage habitat while avoiding the limitations of government bureaucracy. Before hunters take a leap of faith in full support of California’s new wolf era, I’d expect them to require that a commitment from all parties to the sanctity of the hunting culture and the proven value of regulated hunting as a game management and habitat-funding tool. Exactly how can habitat improvement be funded? How can forest management policies be changed? The details are the question. A status of “Endangered” can only turn into funding or improved policy if the public pushes for it. The public outcry to list the wolf will be fruitless if that same public does not lobby for the funding and policy change necessary to make the listing successful. Is it possible that hunters and non-hunters could join forces to create an unprecedented mandate for habitat improvement in our state? Could traditional conservationists and environmentalists become an undeniable force that rocks the wolf-ungulate ecosystem? For years conservationists have unsuccessfully attempted to elevate the quality and quantity of deer and elk habitat in California. The wolf listing could be the catalyst that allows meaningful large-scale habitat improvement to happen. It’s time to choose our course. It’s too late to build the fence. A CESA listing can create opportunity for wildlife. The State has many programs that can have the effect of enhancing wildlife habitat to offset habitat losses to roads and development. Because the wolf listing is so unique, I imagine it will take a while for California to figure it out. Wolves live on ungulates – deer and elk. In a perfect world, California should step up and fund a campaign to improve habitat for wolves in California, which really would be a campaign to improve deer and elk herds. That may be wishful thinking, but we need to conserve our wildlife resources. If we don’t, we won’t have wolves, deer or elk. Ball-park estimates are that a wolf will eat about two elk a month – a pack of five about 120 elk a year. California doesn’t have an elk supply large enough to sustain many wolf packs. Because elk are in short supply, people who support the concept of large numbers of wolves in California are banking on wolves prospering on a diet of mule and blacktailed deer. Mule deer have not proved to be a sustaining source of food for wolves, but the coast range and western slope Sierra’s may have blacktail herds that wolves can rely on. California will have as many deer and elk as the habitat will support. It’s hard to know exactly how wolves will enter into the equation, but adding a new predator won’t make deer and elk management easier. Nor will it expand hunting opportunity for people who would like to hunt elk in California at least once in their lifetime. On the other hand, the State of California has indirectly made a commitment to the welfare of deer and elk, because without deer and elk, there will be no wolves. It is possible that, in the short term, wolves will only be transients in California – coming and going with ungulate populations trends and movements. In the meantime, Oregon has the elk needed to feed wolves and California not. Nobody knows for sure what will happen from here. Theories abound. But, wolves have been expanding their territory rapidly and will likely continue to do so for a while. “Great news for wolves! Early this afternoon, the California State Fish and Game Commission voted three to one to grant protections to Gray Wolves under the California Endangered Species Act. Take note of their advertisement. DONATE. I wonder what they do with their money? Habitat work I hope. “Huge news out of California today: The state wildlife commission just protected wolves under the state Endangered Species Act. Today’s decision is the culmination of years of work by the Center, sparked by the arrival of wolf OR-7 in California in December 2011. The timing couldn’t be better. Just hours before the commission’s decision, it was confirmed that OR-7 had pups in southern Oregon — a sign that this once-lone wolf is now establishing himself as a resident of the area, including Northern California. This exciting win wouldn’t have happened without your thousands of letters, phone calls, trips to rallies and generous donations to our Predator Defense Fund. We knew it would be an uphill climb when we filed our petition to protect wolves in California in February 2012, but there was no other choice: If these expanding wolf populations were going to survive, they’d need protection from guns and traps. Today’s decision opens a new chapter in the history of wolf recovery in America. It ensures that California, where there’s plentiful wolf habitat, will provide a safe haven for wolf families like the one OR-7 just started. We know it won’t be long before the howl of wolves, silenced in California for nearly a century, will be heard there once more. Thank you from all of us at the Center. This is a sweet victory that couldn’t have happened without you. Kier’an is wrong about one thing, it surely could have been done without me. The Center for Biological Diversity (CBD) is an expert at listing species and in the long run, listed or not, wolves were going to inhabit California again. I’m not worried about wolves. I am worried about the State’s deer and elk populations. Wolves are now protected, but in order to truly protect wolves, deer and elk need protection. Not from human hunters or wolves, but from loss of habitat. Now that wolves are listed, the Governor needs to fund a massive campaign to create and protect habitat for deer and elk. If Governor Brown and the California legislature really want wolves, then it’s time to pay up. For years California hunters have carried the burden for deer and elk. Now it’s time for others to join in. No net loss of deer and elk needs to be the cry. Wolves or not, deer and elk are a valuable commodity cherished by California conservationists in a way the CBD does not comprehend. And, CBD needs to put their money where there mouth is. Fund habitat. That’s what MDF, RMEF, CDA, CWA, DU, WSF, NWTF, QU, PF , SCI and other wildlife organizations do. They do it with hunters dollars not lawyers. Now comes the task of figuring out what the listing really means. For sure, one thing it means is we need more deer and elk in California. Will tule elk be impacted by wolves? With an antelope archery hunt in August, archery and rifle blacktail hunts this summer, a muzzleloader mule deer hunt in September and a deer/elk Montana hunt in November, I’ll be busy enough with hunting to keep my wife up at night. She’s not that excited about it. When duck hunting is taken into account, it will be a very busy fall and winter. Decided to set up guides for all three of my out-of-state hunts this fall. Since I’ll be traveling alone, it will be nice to have company. The Nevada desert is a lonely place for the solo hunters as I found out last year on my antelope hunt. And, having a guide will get me onto animals sooner with less trouble and packing less gear. I just sent my deposit for the deer hunt to Hidden Lake Outfitters. The deer hunt will last for about 5 days and we’ll be up high in the Ruby Mountains. In contrast, the antelope will start on August 1 and take place in the desert heat. I’ve not put down my deposit on that yet, but it will happen soon. The Montana deer/elk hunt has been scheduled for a while and it will happen on ridge tops in the Bob Marshall Wilderness with Montana Safaris. Now it’s time to shoot my bow, clean the muzzleloader and put up my new tree stand at the ranch. 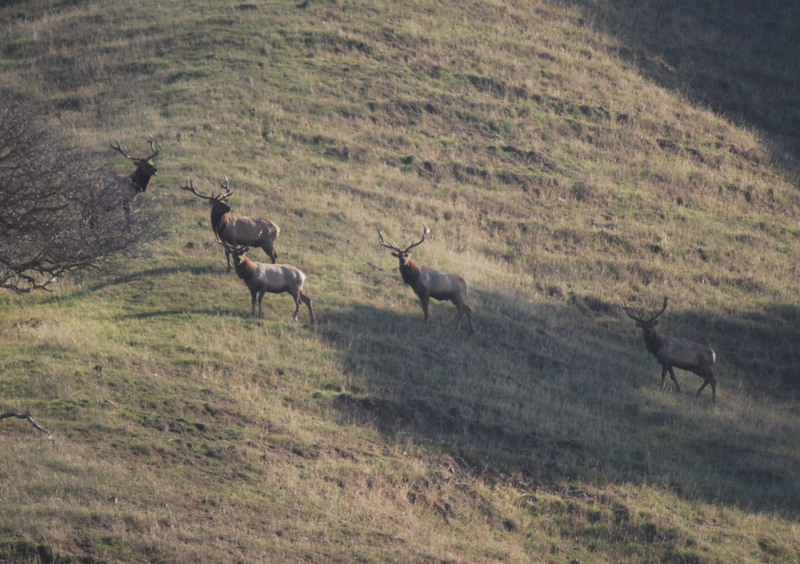 Applying for elk, antelope and bighorn sheep in California was an afterthought. What will I do if I draw one of those tags? Not thinking about that and the odds are extremely low. Anticipation is key to the enjoyment of hunting. I’m sure glad I retired last month. It’s time for the California tiger salamander larvae to morph into land dwellers. This past week we finally netted a larvae that had lost it’s gills and taken on the physical characteristics of adult salamanders. This is what we’ve been waiting for so we know the larvae are achieving the physical development necessary to allow them to leave the pond and inhabit the upland. This larvae was about 125 mm in length – the largest of the day.